Here we are the last day of March. The way the time is flying by Christmas will be here before you know it! My design wall is full with the first half of Kranberries. Today has been spent sewing units together. There is a lot more yet to sew on my April UFO. 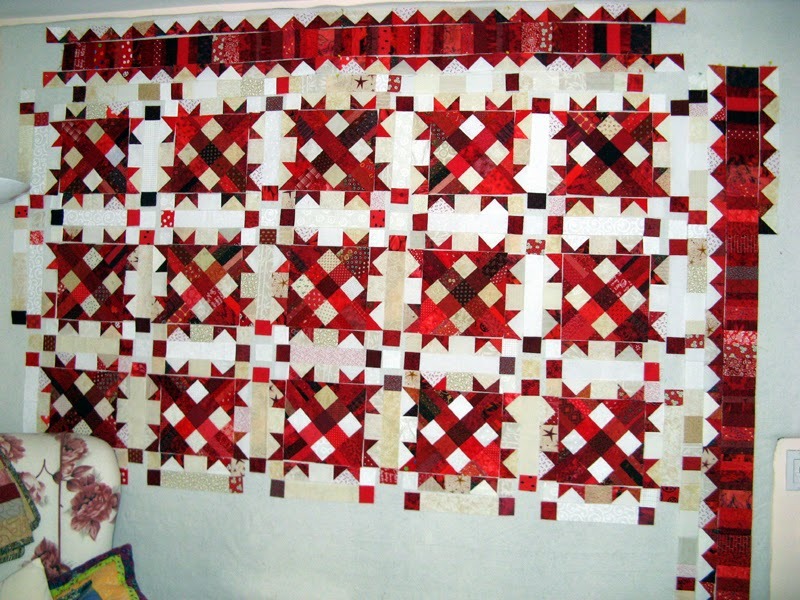 The parade on 52Quilts is tomorrow for March finishes. Marti released the April challenge on Facebook over the weekend. I am so happy I had a good start on this Bonnie Hunter design called Talking Turkey. 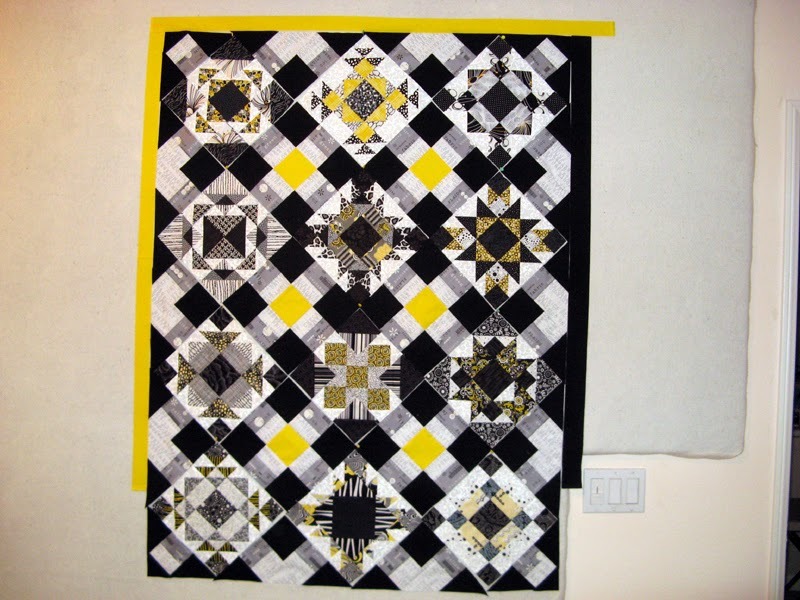 It started with a 9-patch swap and string blocks as you see above. These two units make the center of the block. 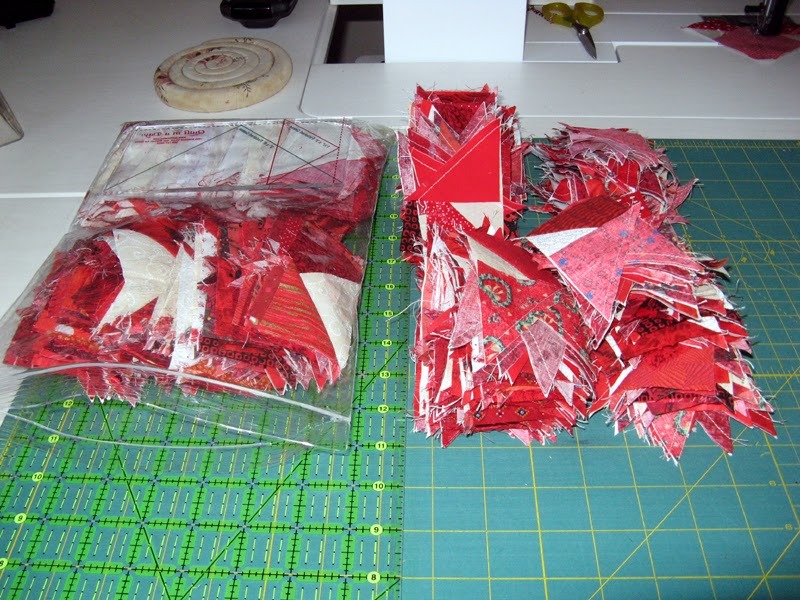 Next lots of cutting pieces for the flying geese, sashing pieces, and string borders. 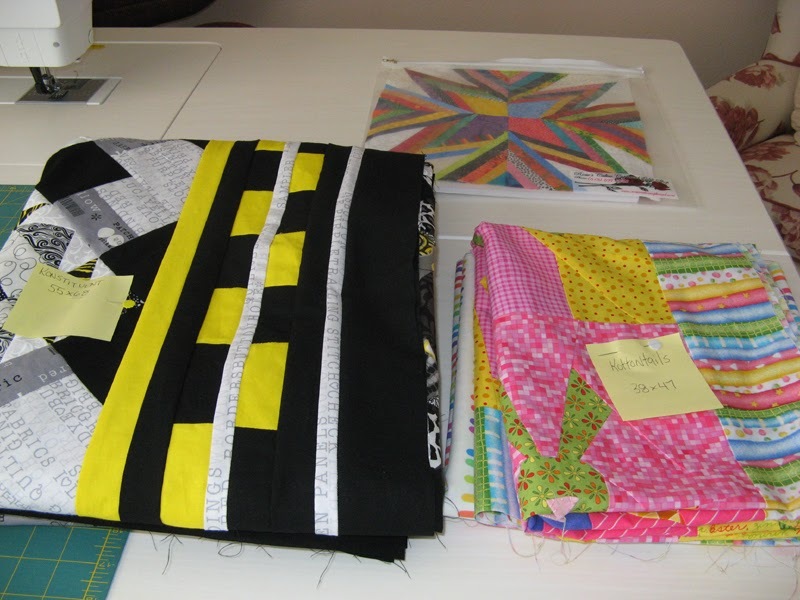 Lots and lots of pieces go into the making of this quilt. Then the second two thirds of the sewing. Figure I am about a third of the way finished at this point. My nephew visits for a week in a few days shy of two weeks. My goal is to have this project done before he arrives. 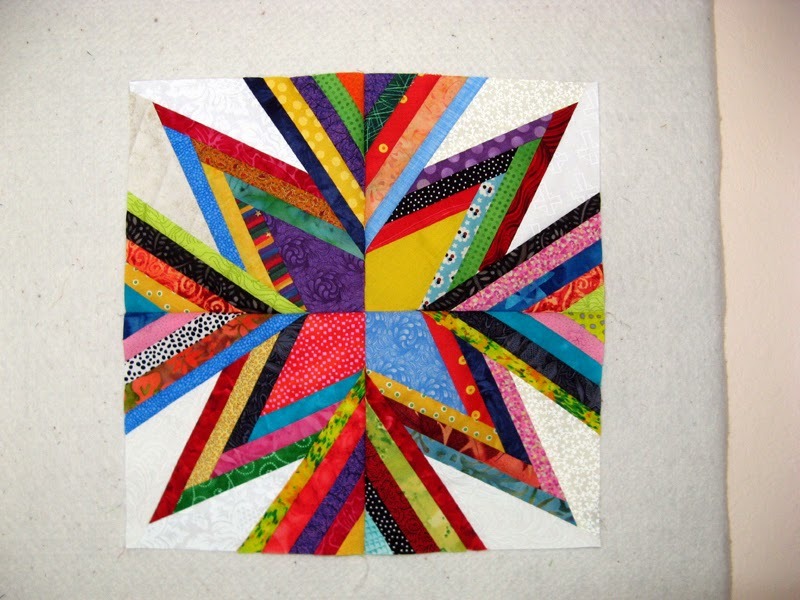 There are more projects to be admired at Patchwork Times today. Let me start with some finishes. I had already claimed the yardage for Konstituent (left) last week, but today I can claim Kottontails (right). 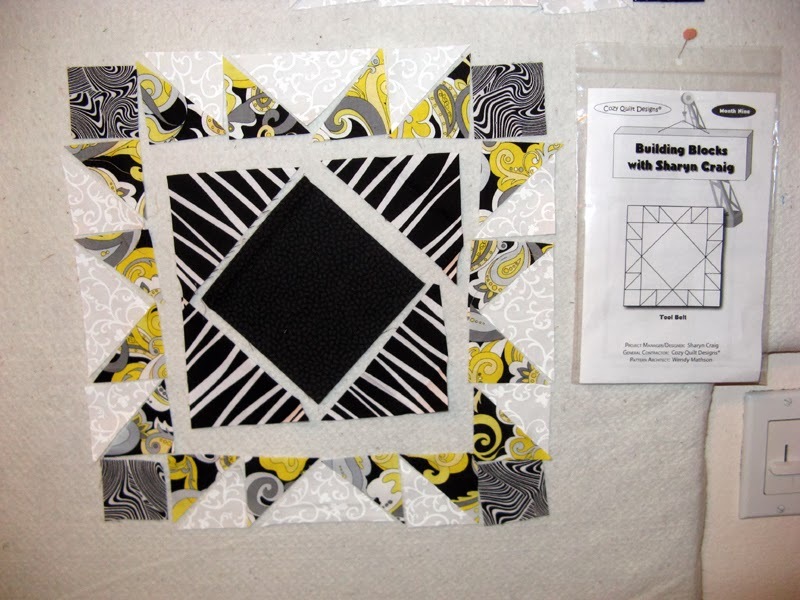 The block at the top is the BOM for April that I will be coordinating at Sunshine Quilt Guild. Always like a positive stash report! This is the back I pieced together for Konstituent (March UFO). 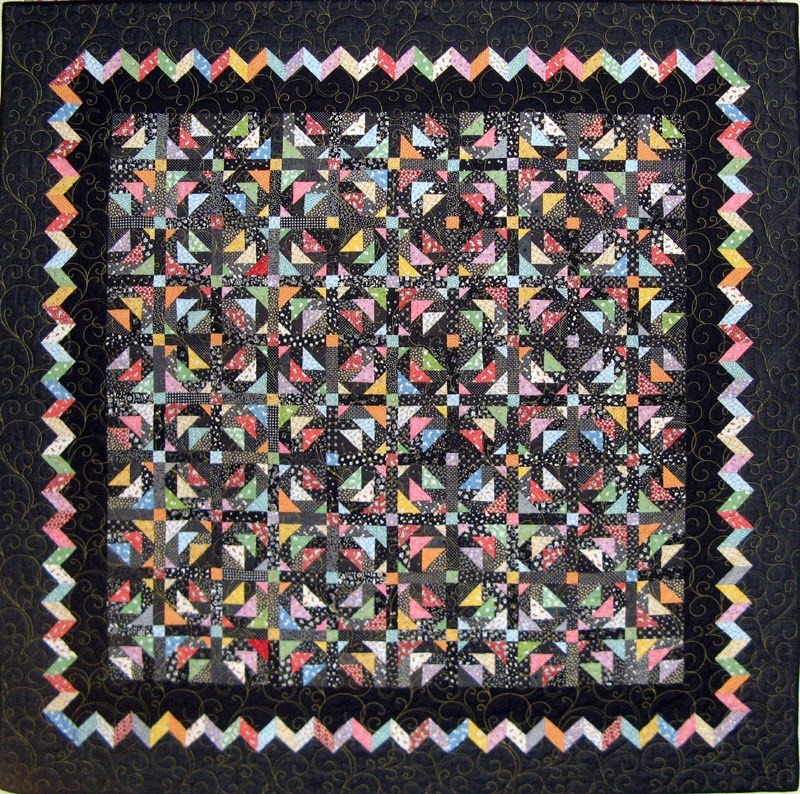 I cut too many of the pieced border units so I used them in the back. I needed another 15" for the width and these came in handy with what remained of the white print that was used in the top. 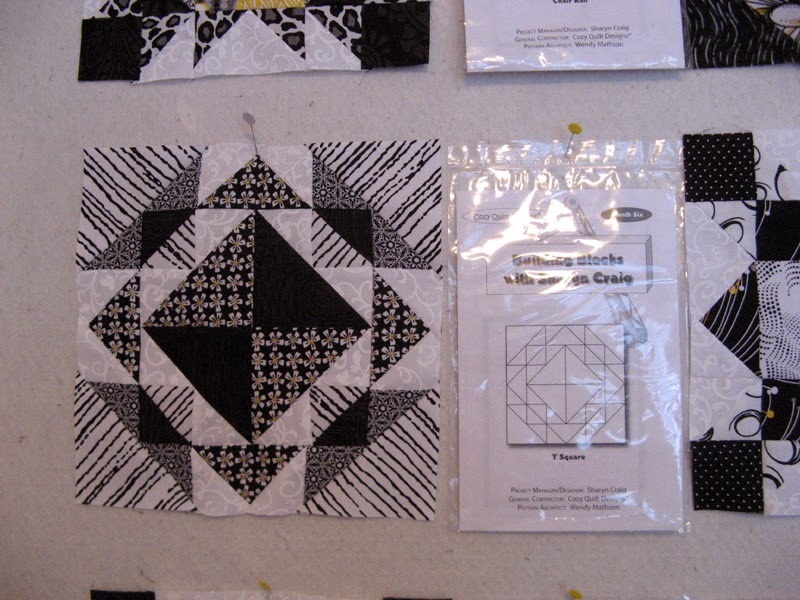 The far right pieced border is the center of the back. The strips will run from top to bottom. Kottontails took seven yards from my stash. 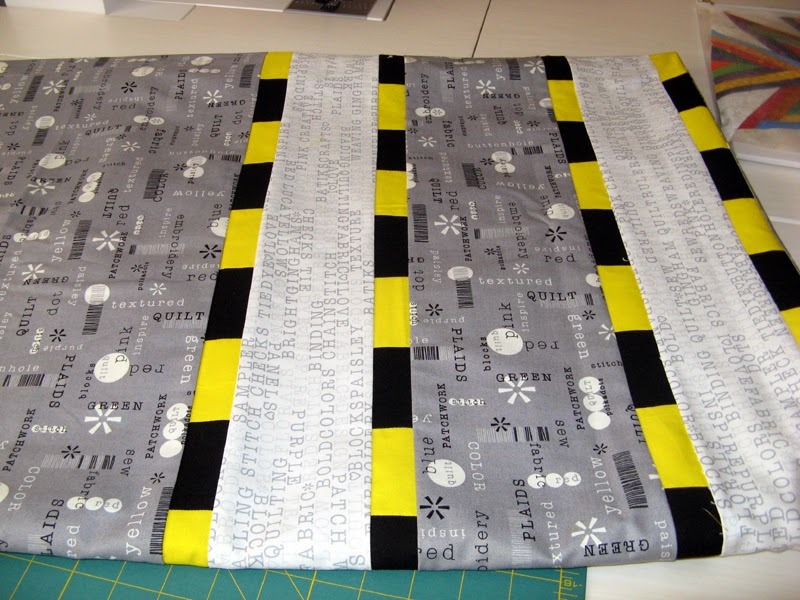 The plan is to use the border stripe cut on the diagonal for the binding. The bunnies get button eyes and two more buttons at the bow's intersection. 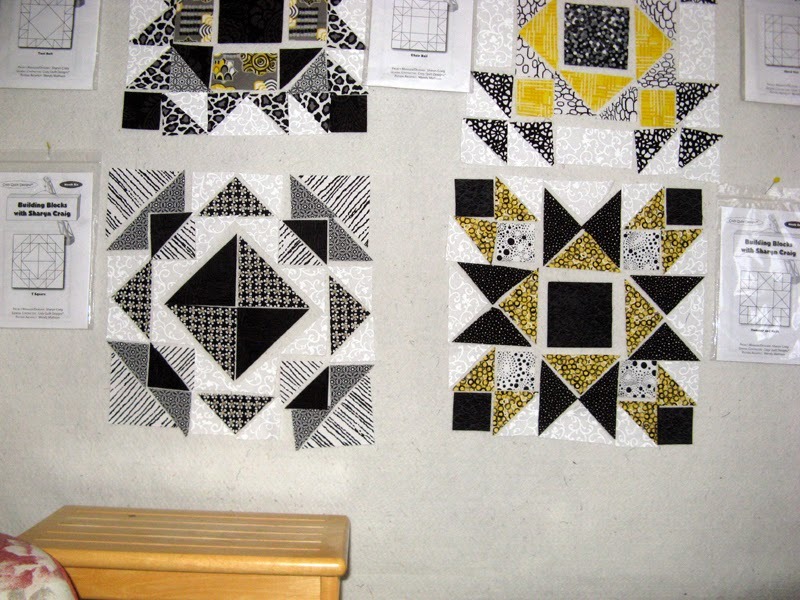 To make the quilting a bit easier I plan to put them on after Kerry's done her magic. This is Kottontails back. 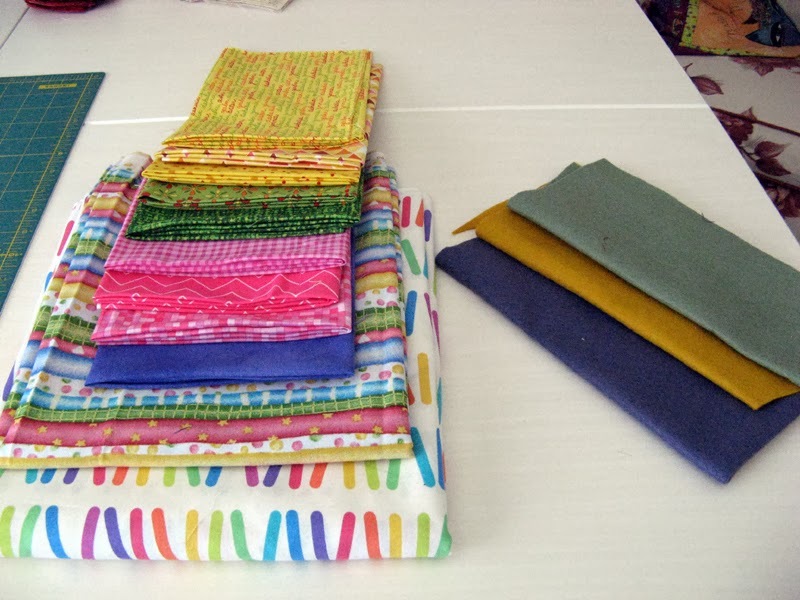 DeLinda shared a fabric sale at a friends home with a couple of us during the time I was gathering fabrics. Both the border and back were purchased then. The binding is all done on Kookaburra. The darker black was also used for the binding. Kerry has Kwiver ready for me. She might also have Keltic Krest done before I have a chance to get to her place. More binding just around the corner! For this week my stats are getting better. My next project is Kranberries...we learned early that #1 is to be worked in April for the UFO Challenge with 52 Quilts. Fortunately I have a lot it done. I'll share my progress tomorrow. Oh it is so nice to sleep in...Today is my Off Friday! I'm enjoying time in the sewing room putting Kottontails together. I will be putting a zigzag pattern on each of the eggs with a complimentary wool. 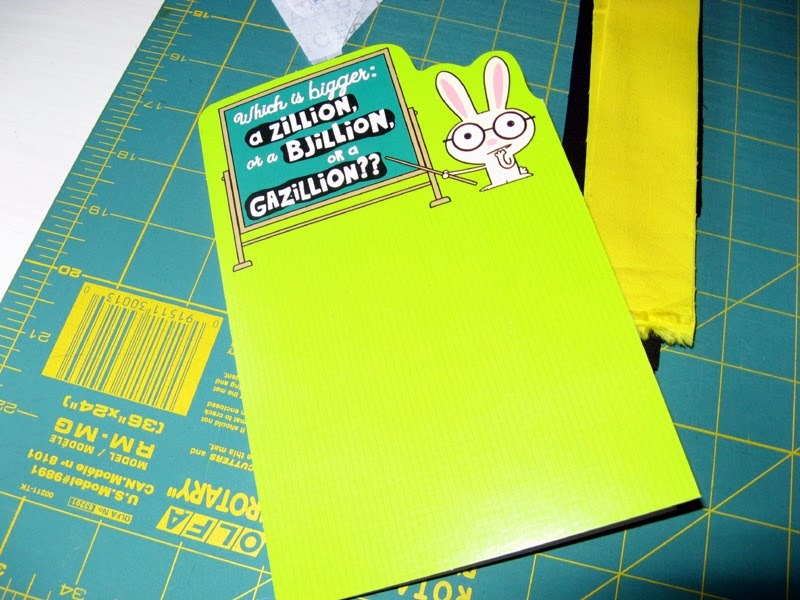 I was able to square my bunnies up to the suggested 11" x 14" size which doesn't always happen with Buggy Barn projects. 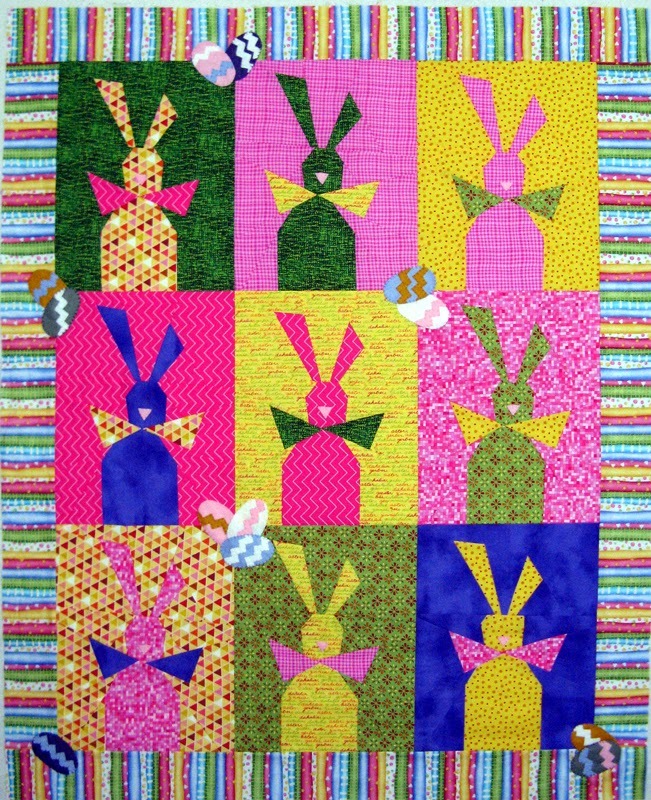 The fabric of the border really brings out the fabrics of the bunnies. Another trip to Michael's for buttons to complete the last two bunnies is part of today's agenda. I hope you have a terrific Friday! Happy to have Konstituent complete. I really like how the borders came out. Brings out the yellow in the blocks just perfectly. 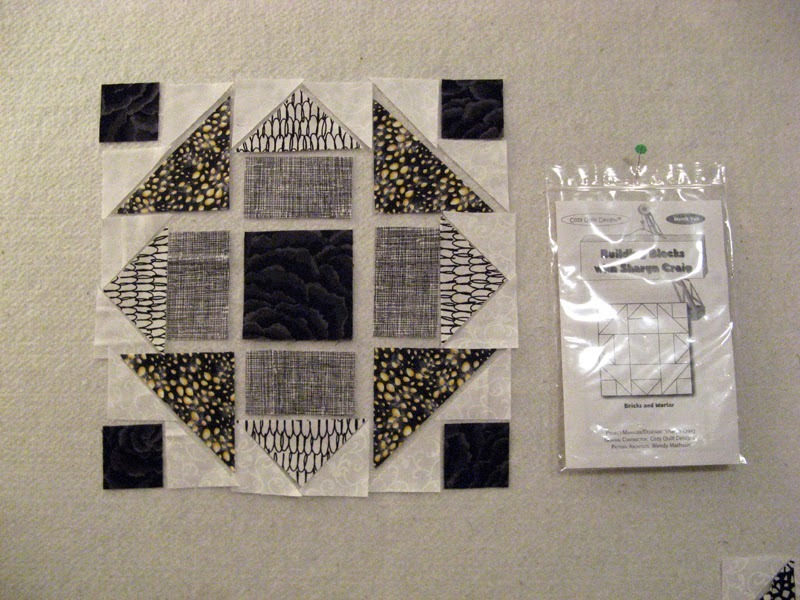 I made more than enough of the pieced border so I plan to use the extras when assembling the back. I do like a more busy back than a solid piece. 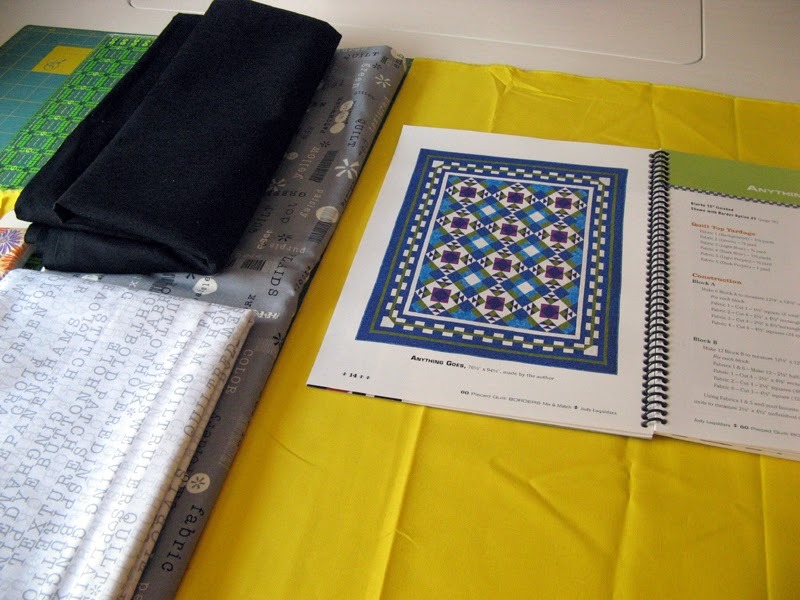 It is the perfect opportunity to use up left over fabrics from the project. 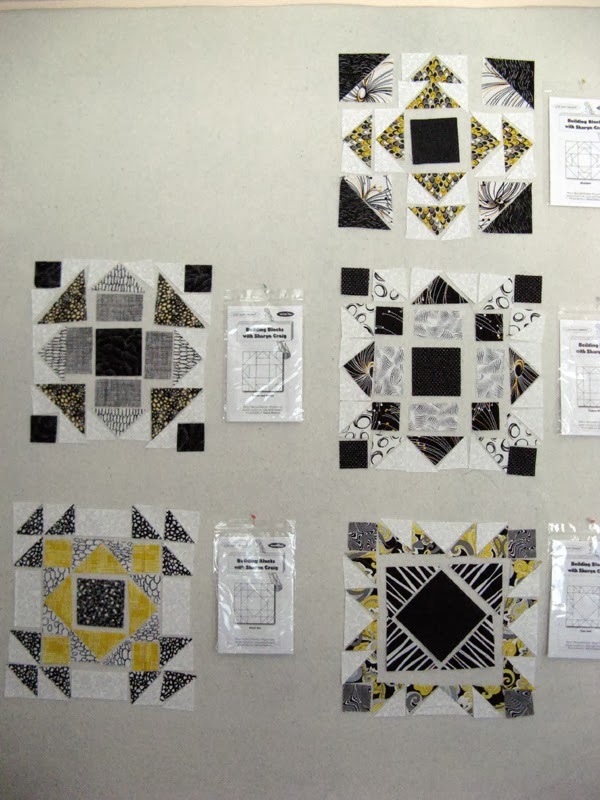 The pieced blocks are from Sharyn Craig's Building Blocks project; the first year of her series. 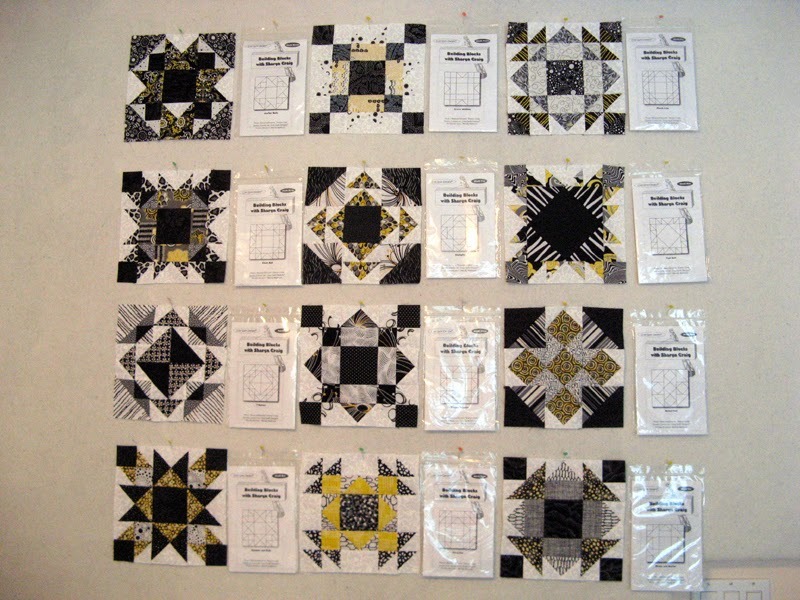 I got the kits for most of the 12 blocks each month noticing early on that the yellow kept slipping into these kits. 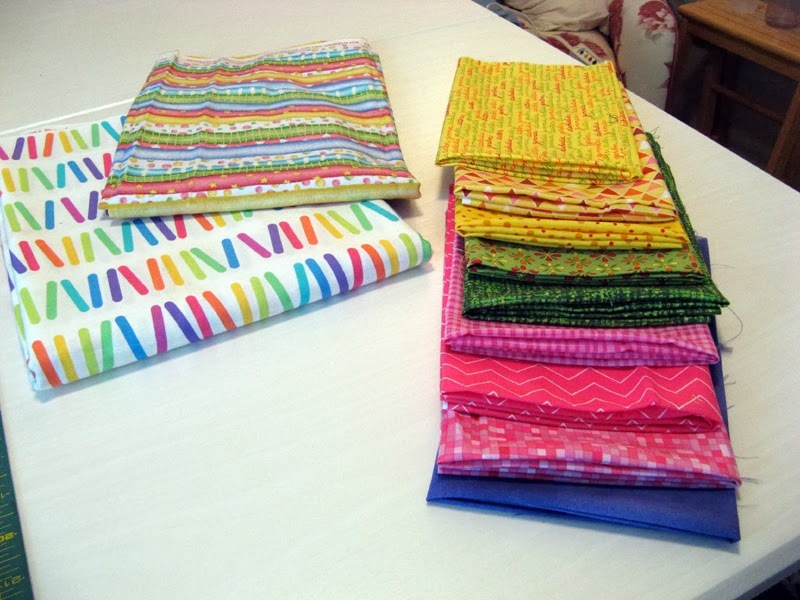 June 2011 is when I first started collecting fabrics that I thought might work well when I got to putting it together. When this project was called to be made I kept a consistent background white on white and let the yellow sneak in as the "pop" in each block. 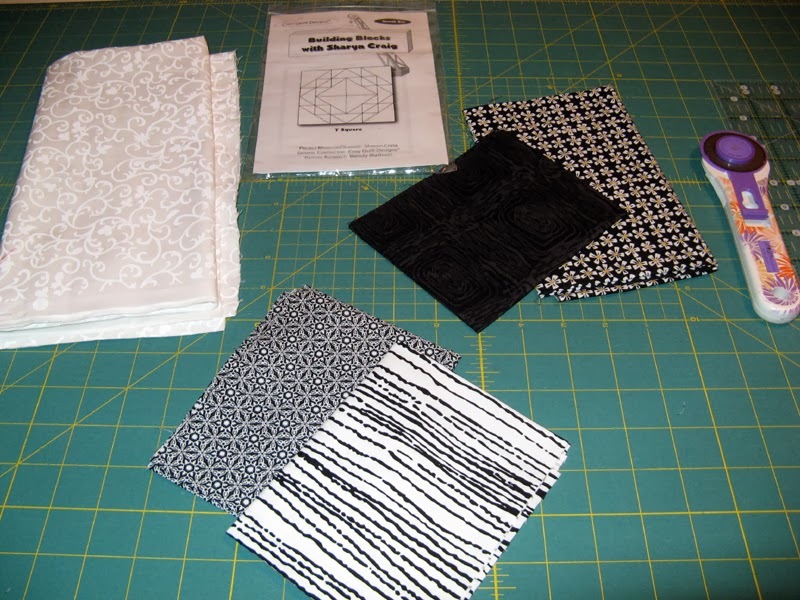 Next came time to set the 12 blocks...Judy Laquidara to my rescue with her book 60 Pieced Quilt Borders Mix and Match. I found Anything Goes to finish my project. Judy's book is a must for your library if you don't have it. Now that Konstituent is complete...it's on to Kottontails. I played around a bit with the block placement and this one seems to work out best. If you have other ideas I am always open to them. I tried not to put colors next to one another, but the possibilities aren't has prevalent as it would appear. Oh by the way, my count of flying geese units made for Kranberries was TWICE what I needed. Apparently I got a little carried away. I thought about eBay, but Kerry thinks we can put good use to them by making a second Talking Turkey quilt. Not sure just how I will use them at the moment. I think I better do a better job in the future of counting! I'll be binding tonight and the next few nights. Sure hope DH has some "good for my viewing" Netflix movies ready to be seen. Have an excellent week. March 2014 is nearly a thing of the past. I've been working all day finishing up Konstituent. I did not want to post until it was done. So guess what? I am done and just loving that I can record 14.5 yards used this week. Photos of Konstituent on my post tomorrow. I am not sure how to calculate the block you see above, so I won't. 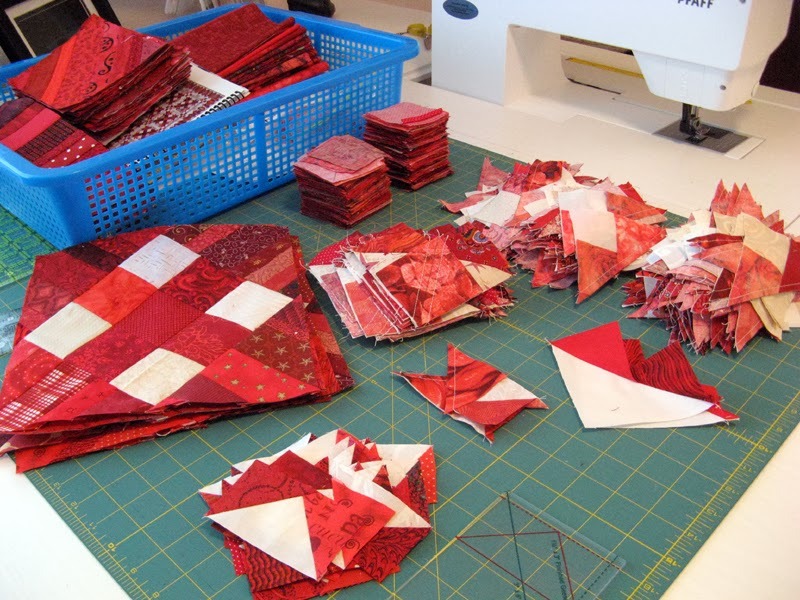 I asked our members if they were up for something paper pieced and had lots of positive feedback. Sure hope it is a success for the guild. 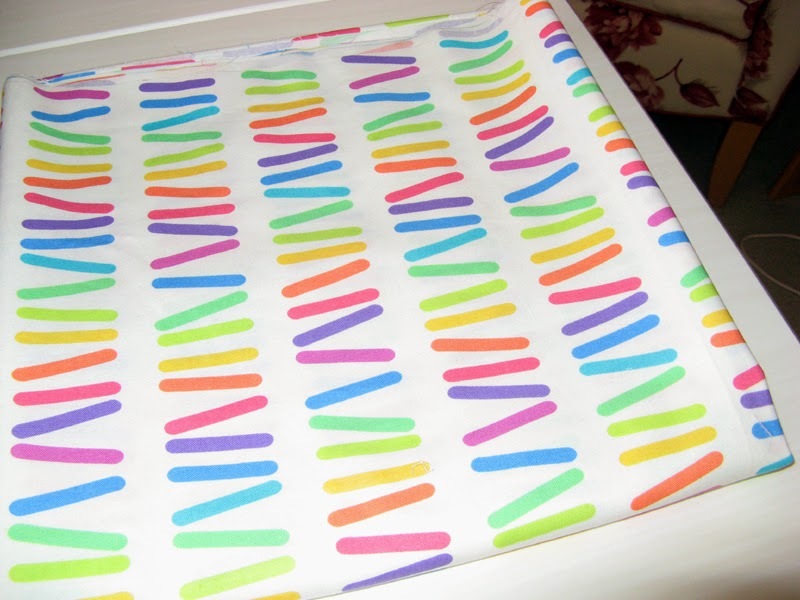 I also brought Bonnie several strips of fabric for a project she will be working on in June; again I won't deduct this...but know that I use my fabrics...nothing stays stagnant in my stash. I am getting closer to getting back in the black! This sure looks like a lot more than what is needed for Kranberries. I realize there are a lot of Flying Geese, but... All done and ready for assembly. I'm working on the borders still for my March UFO. There is a lot of pieces to sew on the borders. More to see tomorrow on Konstituent. So what do you think of the borders? I ran out of room on my design wall to put the last three borders on the top section, but you can see where this is going. I have a bunch more to sew together; this weekend I should be in a position to put it all together. This is Sunshine's BOM. It was a different technique putting it together. 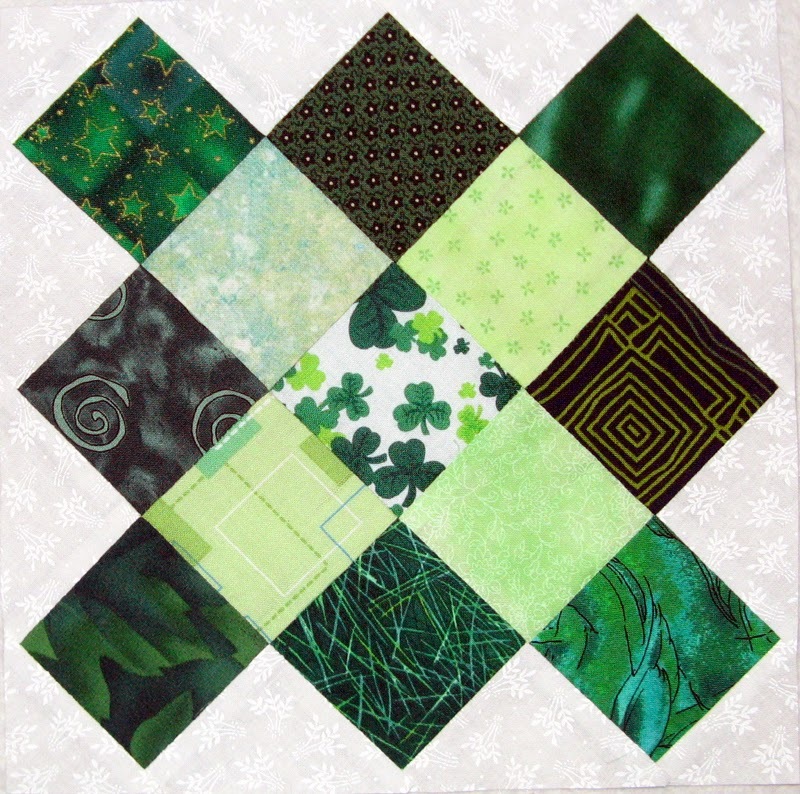 Everyone was provided the shamrock 2 1/2" square and then a strip of white on white 2 1/2" wide. I think it will make for a nice St. Patrick's Day project. Hope the winner can get it done for our next "lucky holiday". Have you been sewing this week? I start today off with my blocks for March 2014 UFO. Initially though about putting a yellow frame around each and then set them together straight pretty much as you see pictured. Then I decided to add more of a flare to the setting. Judy's 60 Pieced Quilt Borders Mix and Match book came to mind. Here are the start of the setting blocks. What do you think? 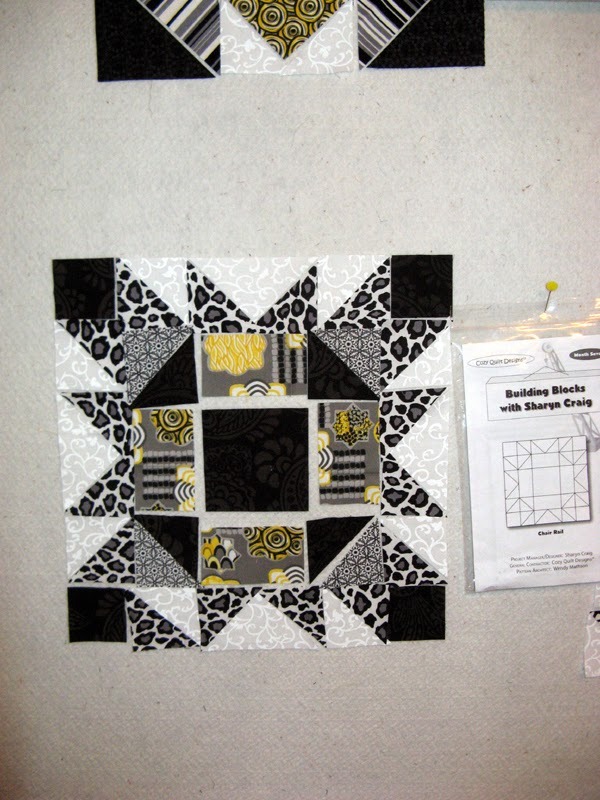 There is a pieced border to add so I am still figuring out what should go next. 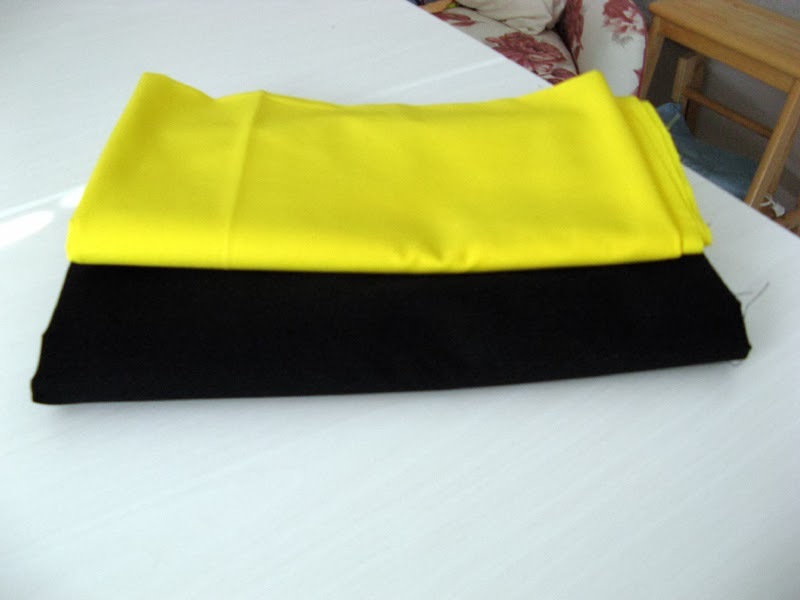 I think the yellow is good then perhaps the black...hmm. 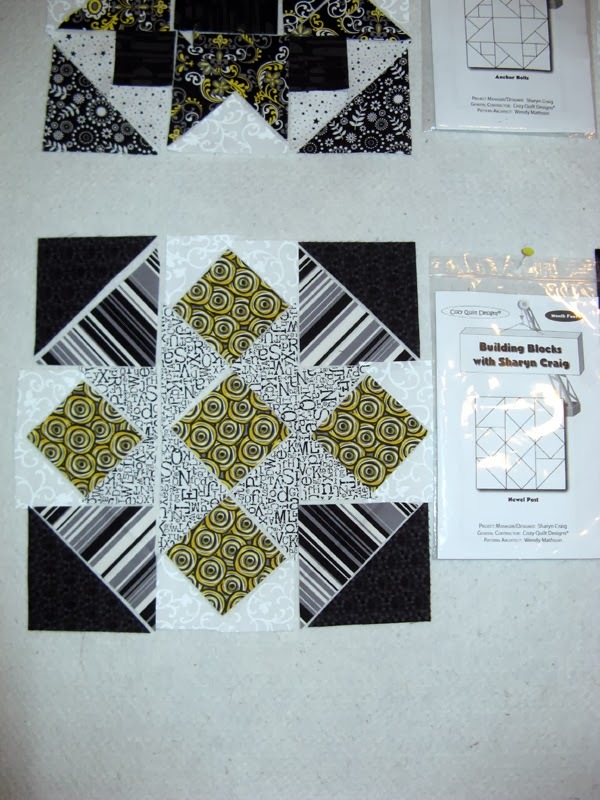 See more great projects through Judy's links today at Patchwork Times. Happy St. Patrick's Day! Will you be having your St. Patrick's Day corned beef and cabbage today like me or tomorrow? I have to work tomorrow so the time needed to prepare would put us way too late eating. I'll be putting everything to cooking in a few hours... In the meantime... I'm sewing! Still trimming the flying geese for Kranberries. I have at least this much more to go still. I changed the way I was trimming which has cut out much of the time. The flying geese Bloc Loc ruler works well for the top or point of the goose side; the part of the unit that needs most of the trimming. Bloc Loc doesn't make this unit's size in one of their rulers so I'm making their 2" by 4" work. My KAI scissors are being used for the dog ears. That's pretty much all these units take before they are square. I sure am happy I started working on this UFO before Marti of 52Quilts called for it to be done. This Bonnie Hunter project Talking Turkey is taking lots more time than 30 days would have allowed. Oh, did you pre-order her new book yet? I did it through her website. With a little luck in timing I should have my book the first week or so of April! I mentioned yesterday that I was picking up two quilts from Kerry. Here they are; Kwetzalcoatl and Kookaburra. Plans changed on the thread for Kwetzalcoatl. I wanted to use the glow in the dark green thread, but during daylight hours it is a very pastel green that just didn't look right. 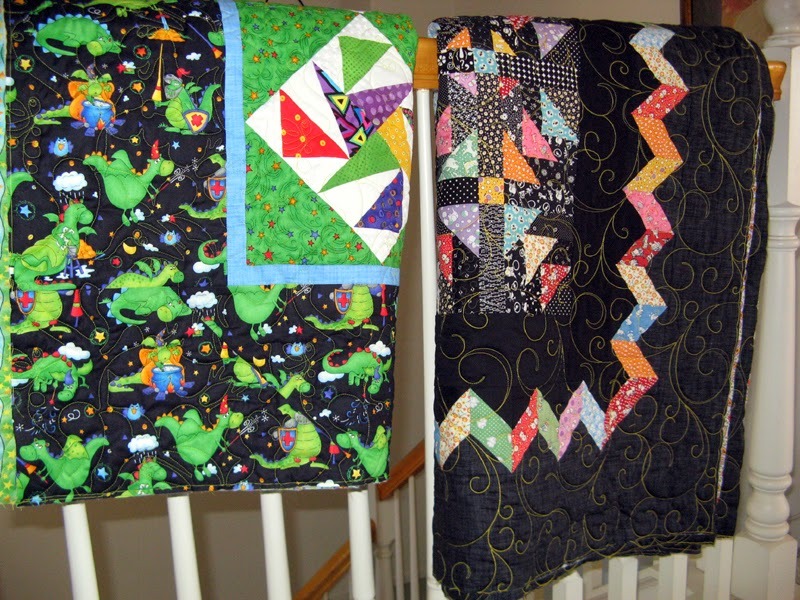 Instead we used a bright green with a cute dinosaur quilting pattern by Ann Bright called Dinomite. (For those who don't know Quetzalcoatl is a Mexican Dragon.) Kookaburra got a very bright yellow thread. The center of Kookaburra is very busy where the quilting no matter what the color would not show, but the black borders look awesome with the thread. 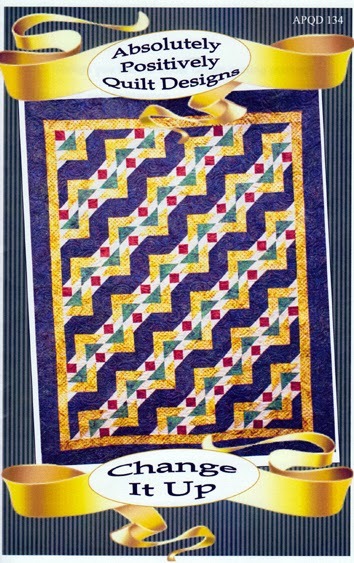 The quilting pattern is also by Ann Bright called Little Swirls. I will be showing a full view after the binding is on. Bindings for Kwetzalcoatl will be that bright starry green and Kookaburra the solid black used for the inner border. Nothing to change my stash statistics this week, but maybe Konstituent will next week. Check back tomorrow to see Konstituent...I have come across a great setting idea that I am working on today. 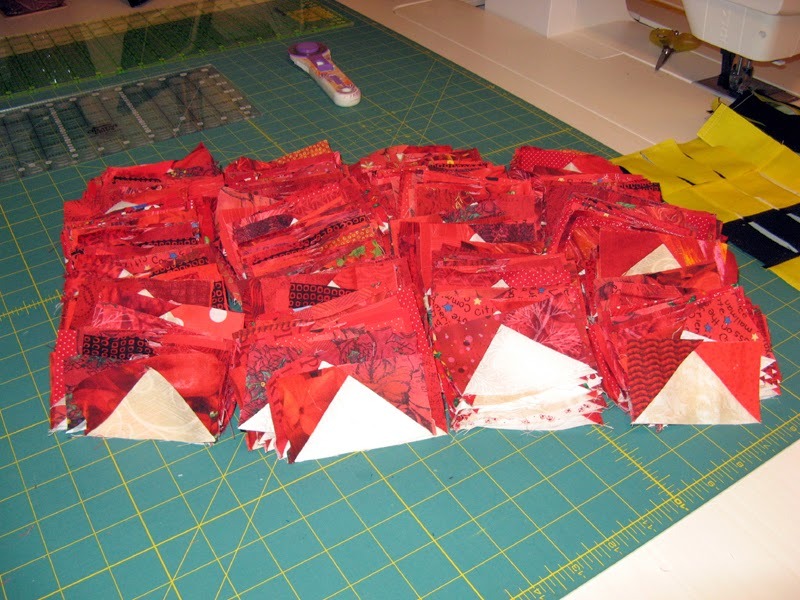 All the blocks are sewn together. It is sashing time! This block was the most difficult to assemble. It also happened to be one of the last ones cut. I do like the way the stripes give it movement. I'm off to visit with Kerry and she has goodies for me...two finished quilts! Happy sewing! Here are Blocks Six and One. 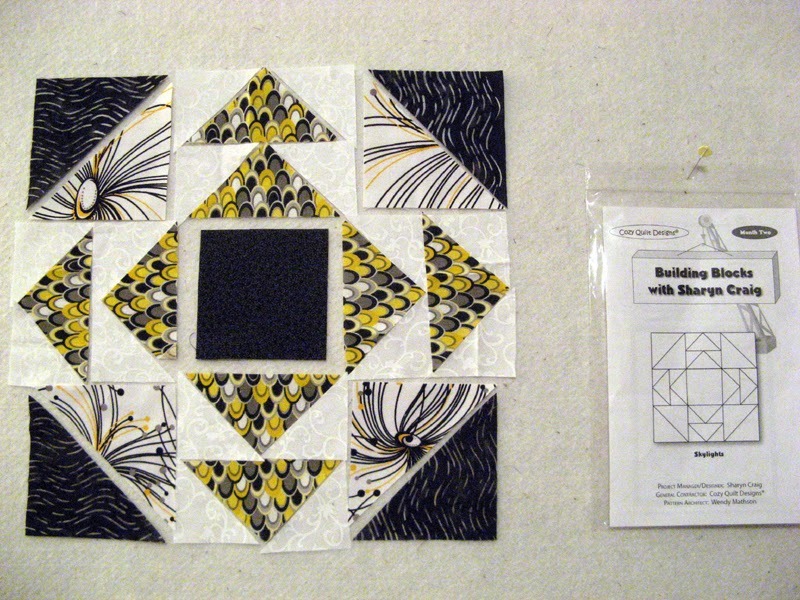 Block Six (T Square) doesn't have as much yellow in it as most of the blocks, but the yellow frame I have planned should pull it out. 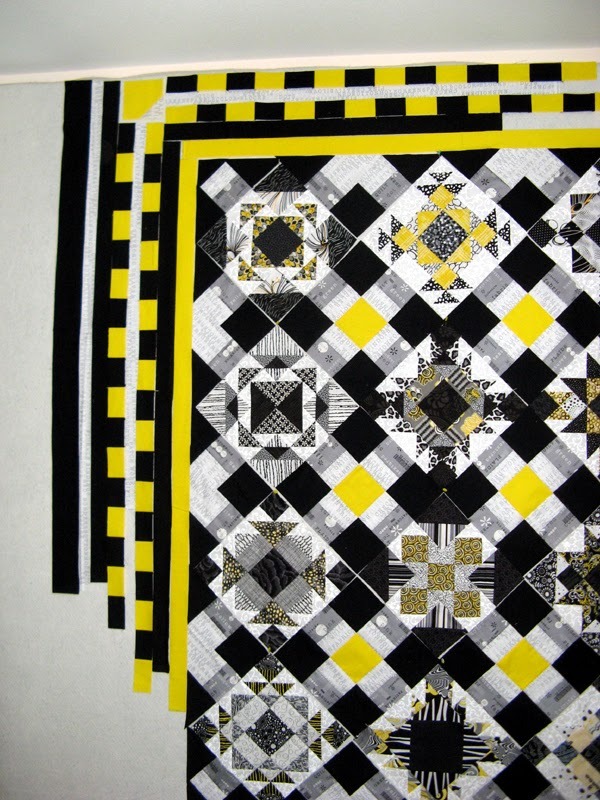 I think the yellow print in Block One (Hammer and Nails) is my favorite of all the yellows. 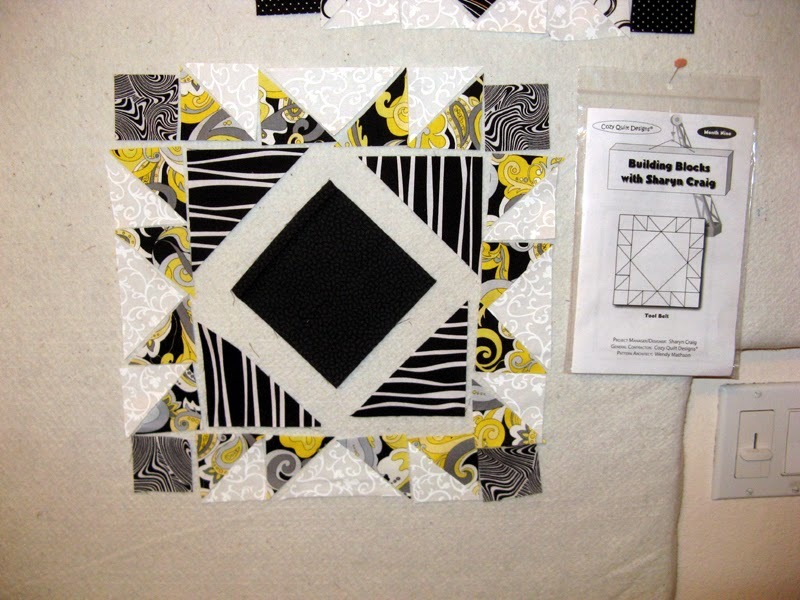 The last block to cut is Block Five, Plumb Line. There is another stripe to fussy cut...where will it be placed? Definitely the darkest fabric is that center square! 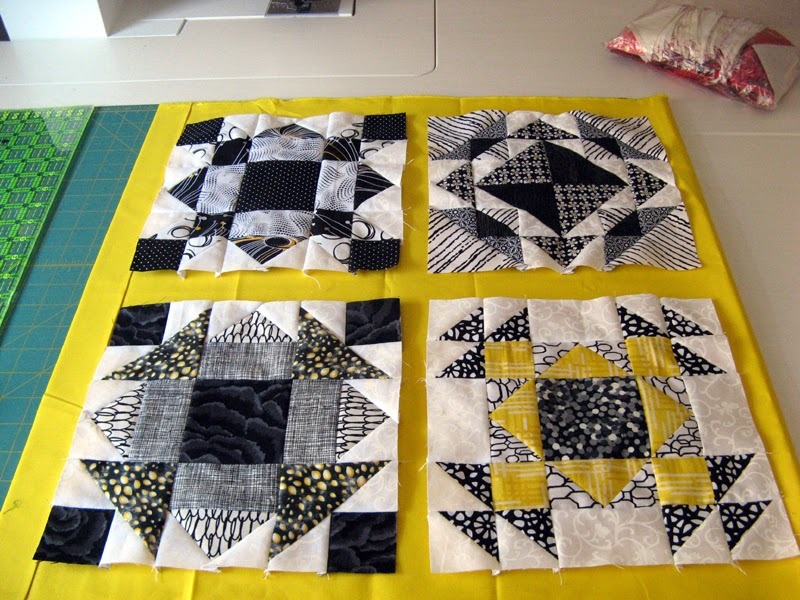 I plan to be sewing all the blocks together later today. Anxious to see these blocks together. Enjoy your Friday! I have been working on other things...must get back to my March must finish project. I suppose there must be something to it's being a UFO! This is Block 6 called T Square. This one has an on point quarter square triangle in the center. I'll be using the two fabrics at the top right for it. The print has the yellow in it. Another one to fussy cut the stripe so the block radiates outward. Before I call it a night this block will be cut out. 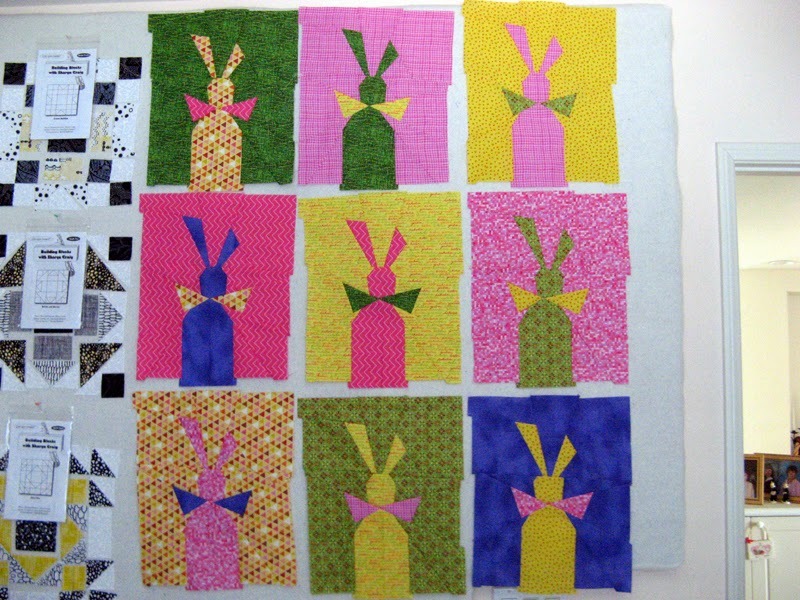 These are the bunnies from my Buggy Barn Bunny Trails workshop on Tuesday. I was able to sew four of them that day. The others kept calling out to be finished. I just couldn't help myself. The remaining five were sewn as soon as I got home from work. I will be putting this project on the shelf until I can get my UFO done. Too bad the bunnies must wait. Tomorrow I'll be back to trimming flying geese at lunchtime. Enjoy your Thursday! These are the blocks cut out and arranged so far. There are three more to go before I start assembly. These last three (the blocks on the left) are darker than the first six. 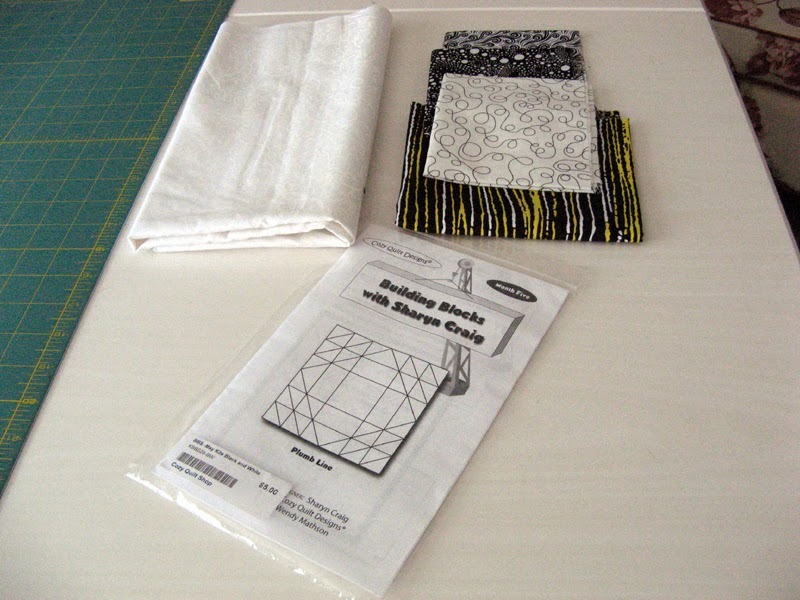 It all has to do with the fabrics that came in the block's kit. Yellow as an inner frame and black as a sashing still seems right. I've been moving ahead on the gazillion flying geese of Talking Turkey (my Kranberries). I am squaring them up now, all sewing done. I have a busy day ahead. 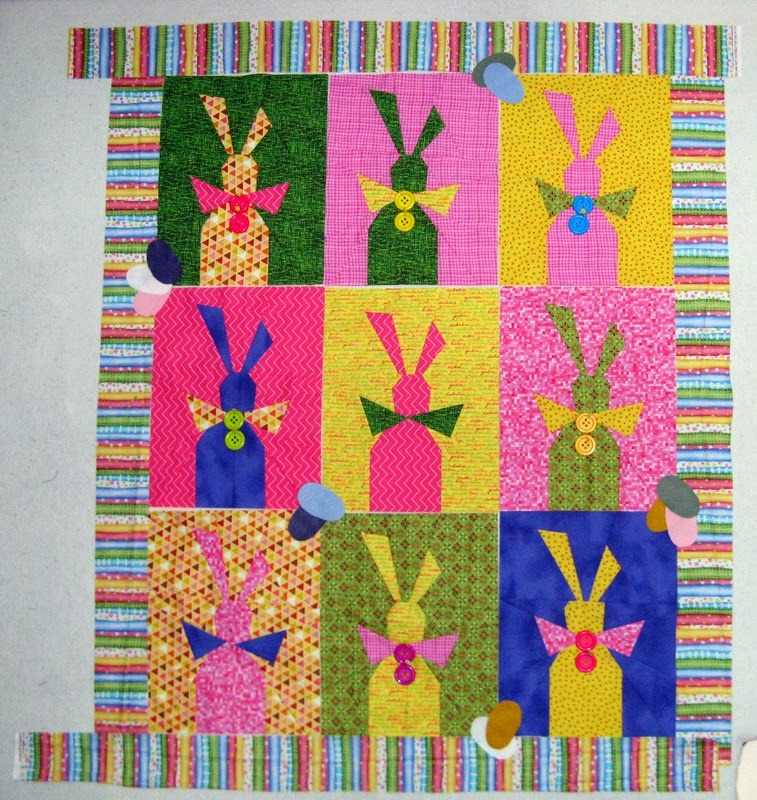 A Buggy Barn workshop making Bunny Trails on Tuesday afternoon and Sunshine Quilt Guild monthly later in the evening. 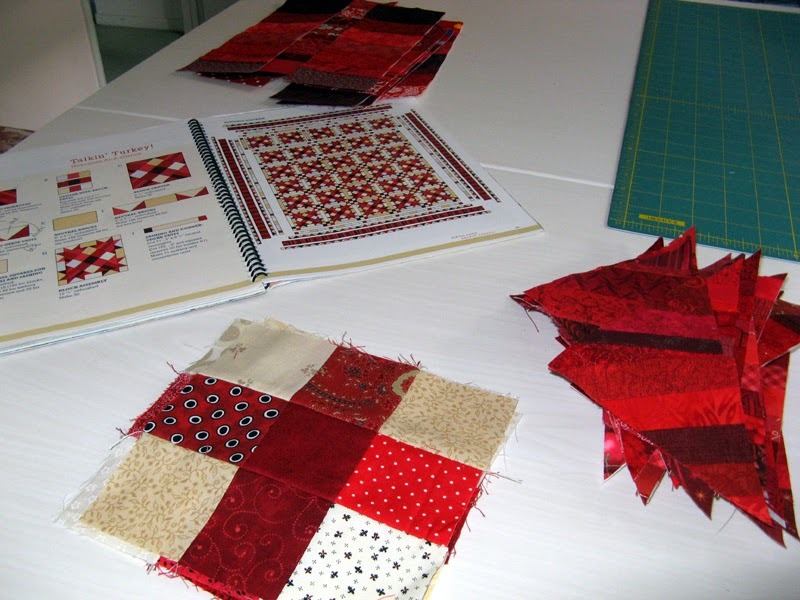 See lots more projects through the links at Patchwork Times. 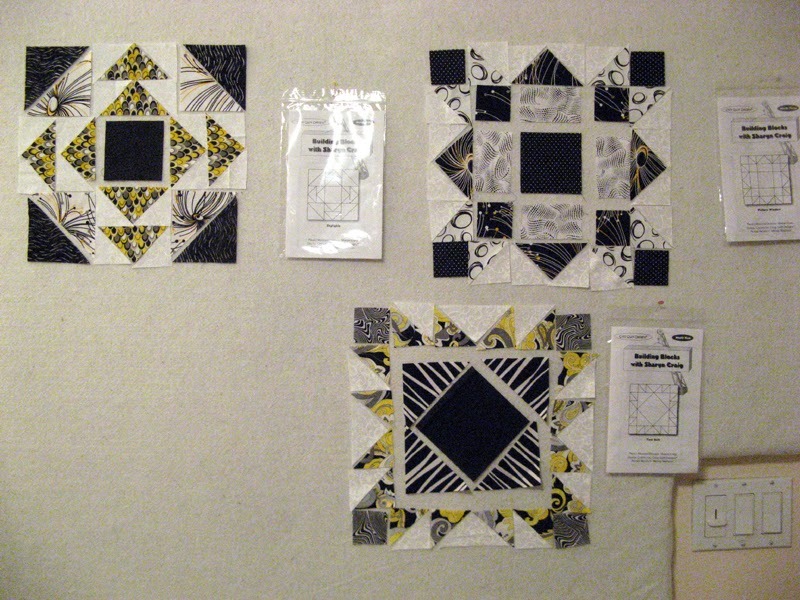 Bits and Pieces on Friday had three yellow/black/white prints that I'll be using for Konstituent's accent on three of the twelve blocks that this project will have. The neutral star will work well for a future UFO that is patriotic. Wool for eggs needed... Found a blue, pink and white today at Country Loft in LaMesa. I think I'm set now except for the buttons. I will need a bunch of 3/4" to 7/8" buttons. I think each bunny takes two. Class is on Tuesday...I'm almost ready! A stop at Memory Lane had me pick up one of their patterns. There is a different layout when you go in the door of their shop that I'll be using. There isn't a photo of this layout, but I like it better than the cover layout. One just needs to rotate the basic block and the look is so much different. I'll be on this one in the future. San Diego has a quilt shop hop going on right now so the shops are a busy :)! I took advantage of a 15% discount and picked up the neutral star fabric. It was the last three yards on the bolt. I'm thinking it will have a place in a patriotic project that I have on my 2014 UFO list. 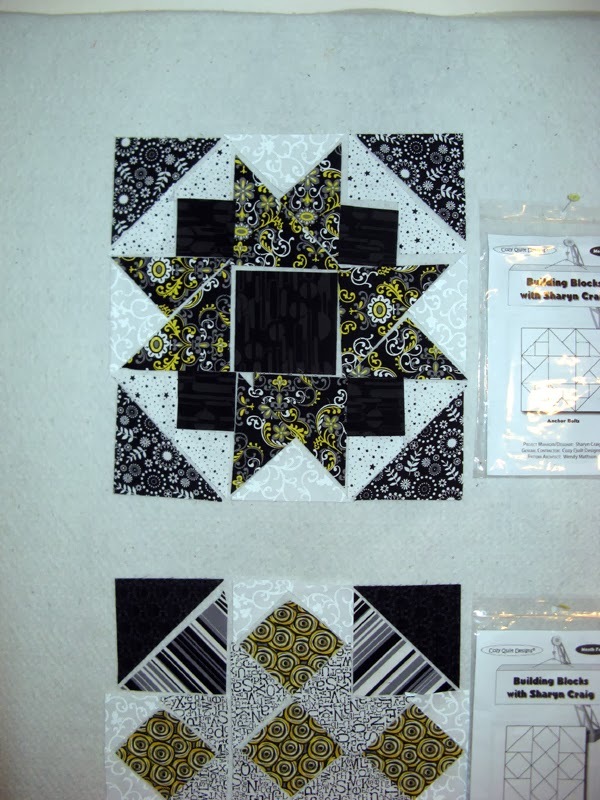 This is Block 8 of Sharyn Craig's Building Block series. It is called Hard Hat. 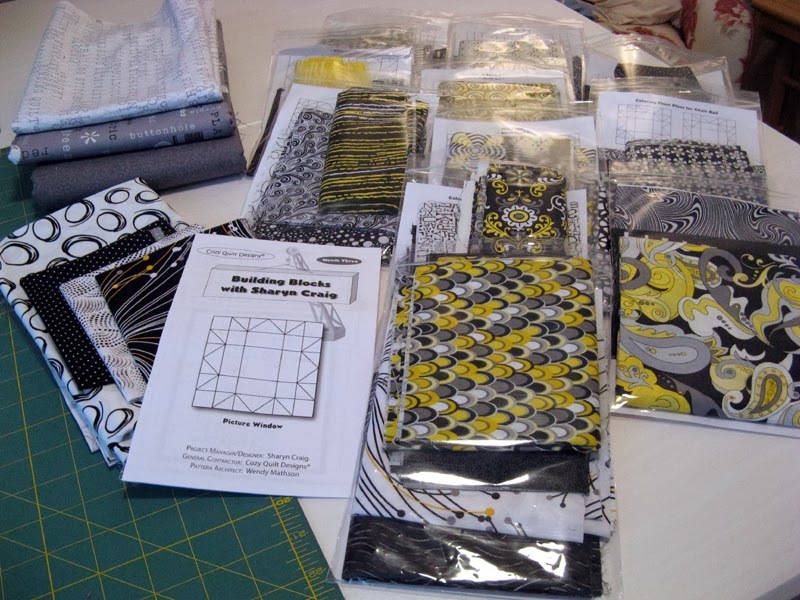 The black and white prints were so busy that I decided on a solid like yellow fabric instead of something more "printy". 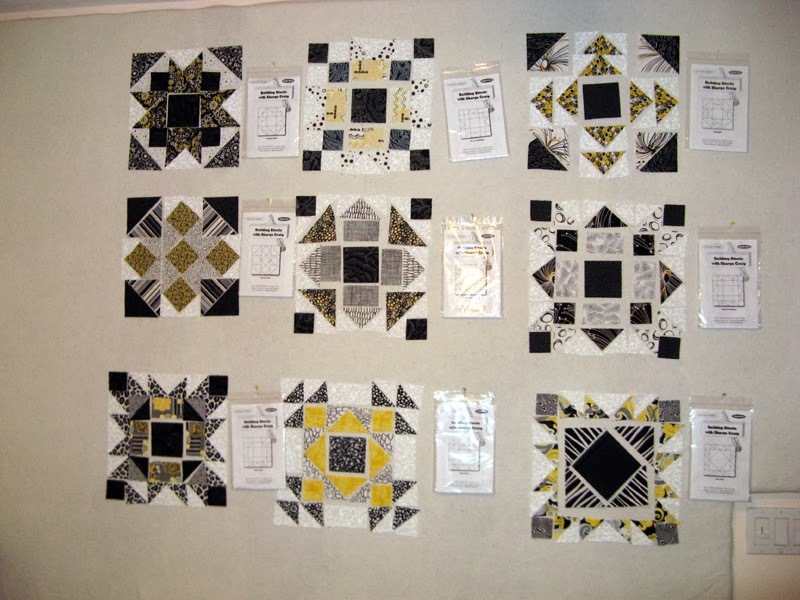 I'm still on track to have half of Konstituent's blocks ready to sew by Friday. This UFO is on the fast track so I can get back to the gazillion flying geese required for Kranberries. Konstituent Block 2 is cut and on my design wall. Took some creative cutting to have all the flying geese fabric going the direction that I desired. Don't they look like fish scales? This is what I have so far. Frankly I'm going crazy that these Blocks aren't all lined, but it's just too late tonight to rearrange. 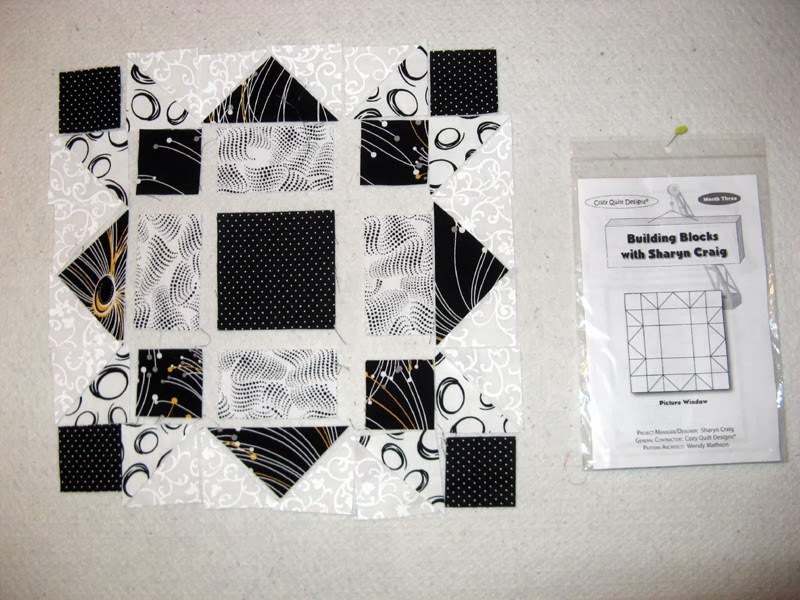 The third block to assemble is getting a little easier to figure out fabric placement. Do you see the commonality between them other than they are all in the same fabric colors? Hope I can keep this trend going with the remaining designs. Last night Konstituent Block 9 pieces were cut out and arranged. 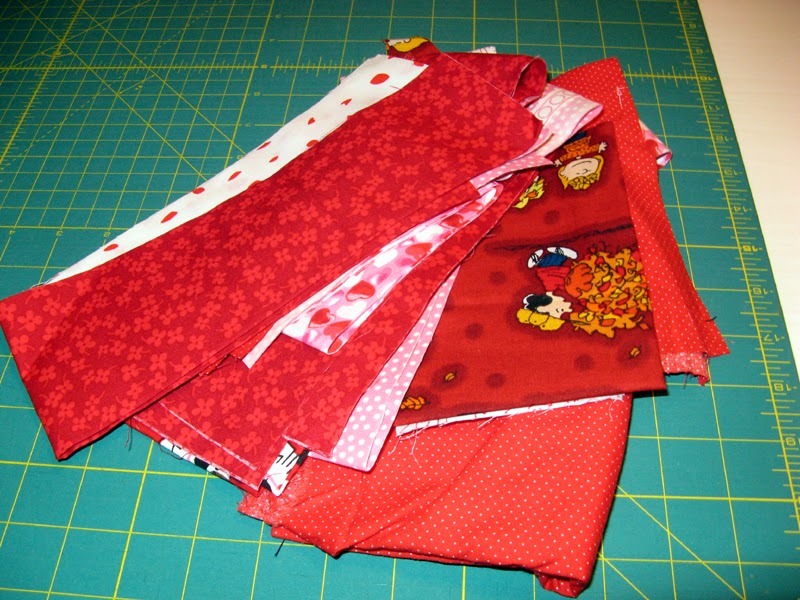 I hope to select fabrics and cut out a block a night through Friday then get to sewing. What is your thoughts on the stripe? I have enough to play around a bit so I'm thinking the stripes need to all go the same direction or maybe I cut the fabric to have them radiate from the center. May move the yellow print around so that the corners have a little bit more black in them. 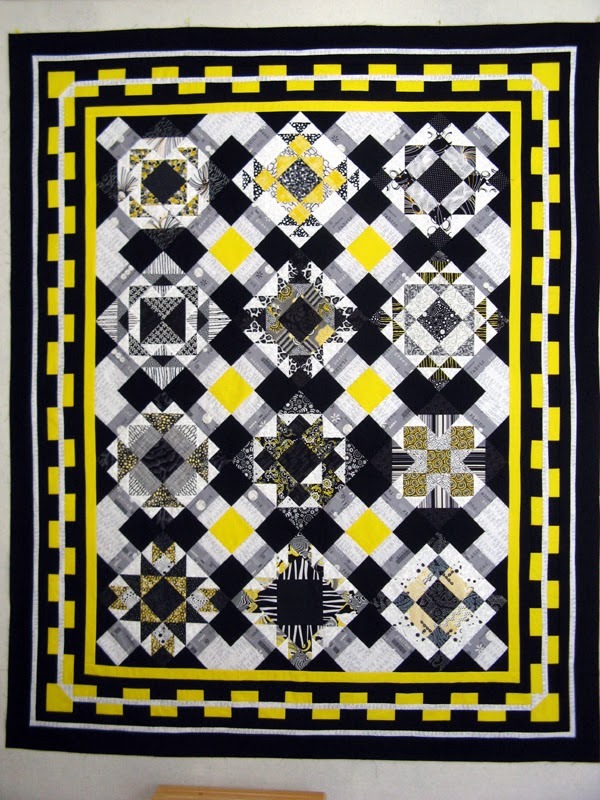 The yellow seems to diminish the corner squares. Thoughts? The mail brought me two packages on Monday. 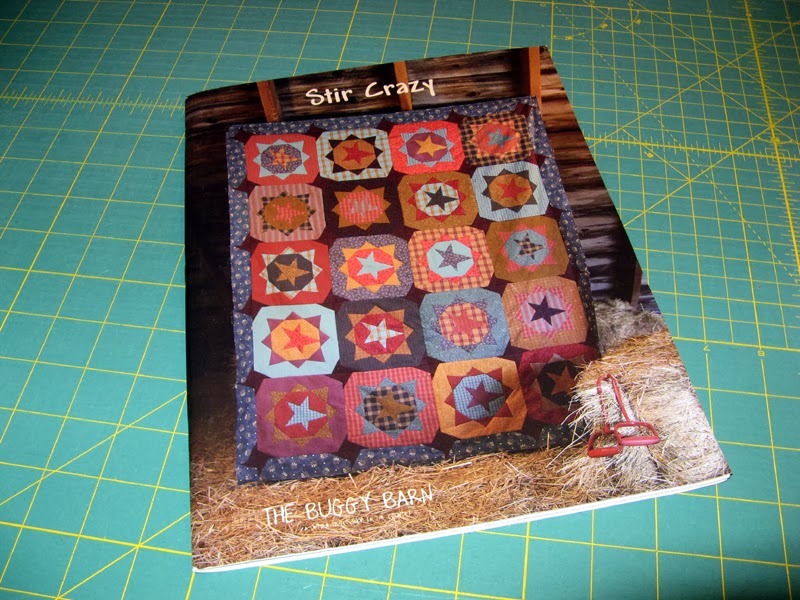 First is The Buggy Barn book Stir Crazy that I need for my Bunny Trails project...Kottontails. I sure was happy to see it arrive before class day on March 11th. I like another pattern in the book called Winter Blooms and then there is the Tree Skirt... I can see this book will get some use in the future. Don't you just love it when a book of patterns brings more than one project to you? I got the book on Amazon for half the cost. 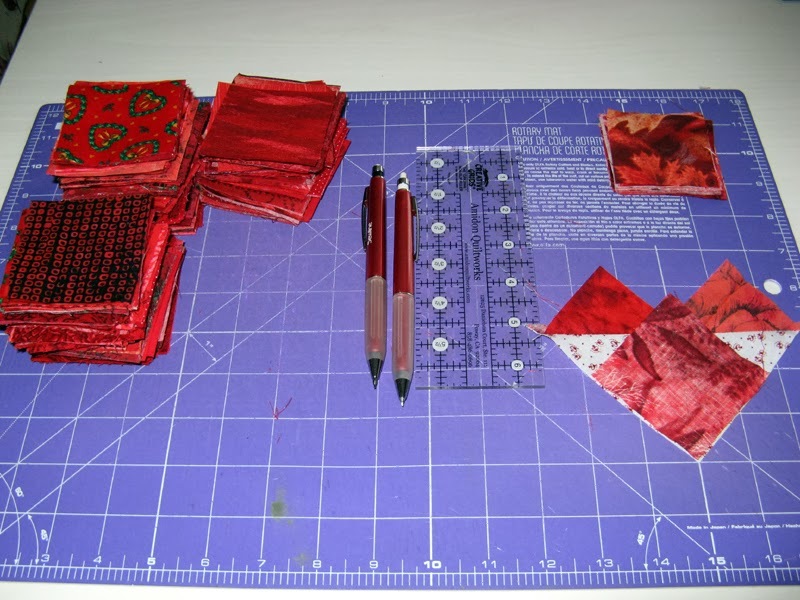 Mom sent me some red scraps that might find a place in Kranberries. I'm pretty much set with what I think I'll need, but the Charlie Brown and Dog prints may just have to be included in the string border. I started off Sunday working on Kranberries. 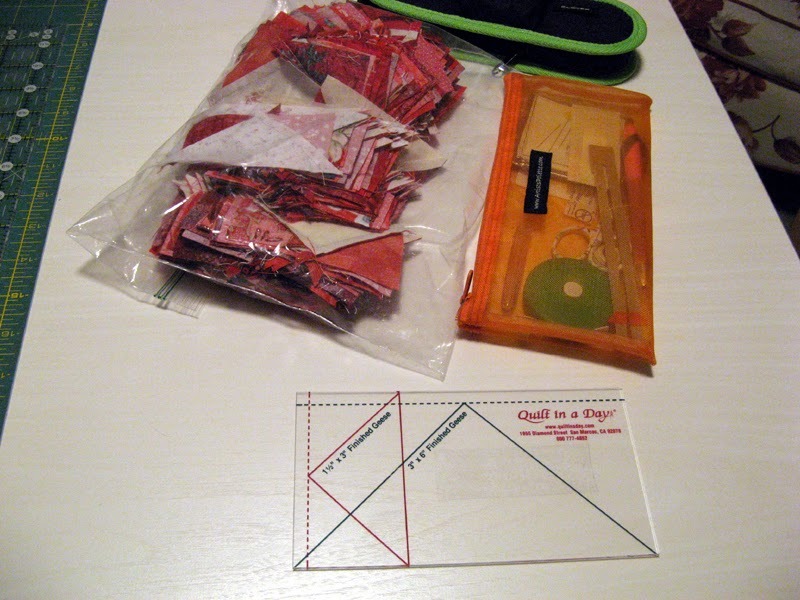 All of the 2 1/2" squares have been marked with the diagonal line; ready for sewing. 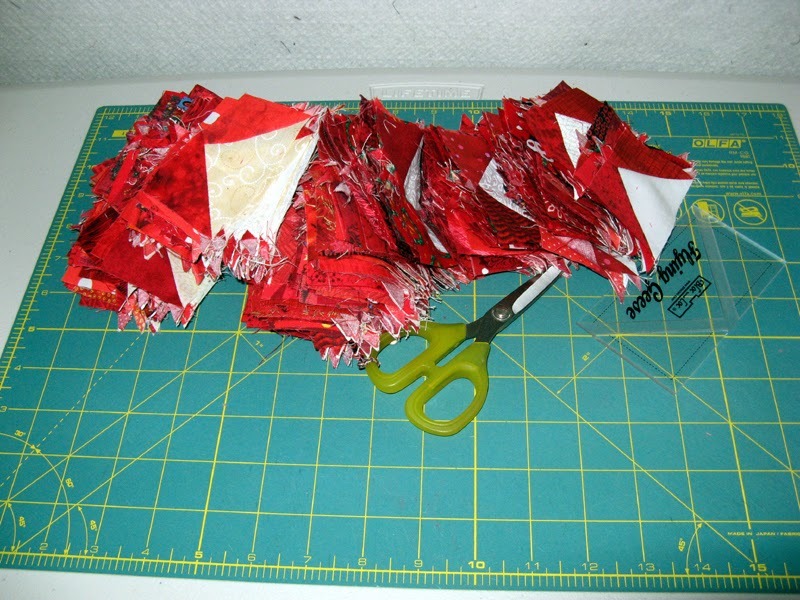 I have a lot of partial Flying Geese ready for finger pressing towards the red. See that stack on the bottom top right side? Lots and lots of Flying Geese in this project. I cut a few of the 5 1/2" strings and attached to the odd size 9-patches. Besides what I can get in during my lunchtime this project will slow down until March 2014 UFO is done. Just when the Oscar's Red Carpet started I turned to fabric selection for Kottontails. The pieces on the left will be the back and border. 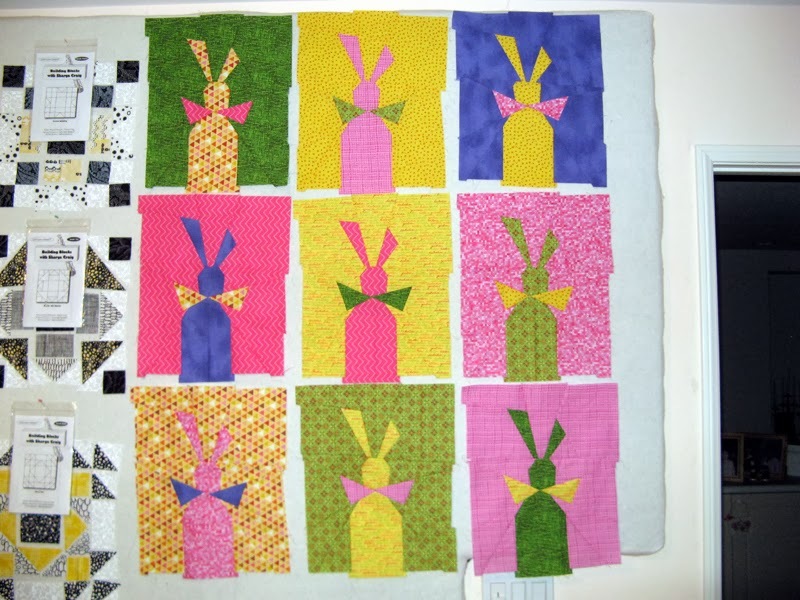 On the right are the bunny blocks. I will be using 3 yellows, 2 greens, 3 pinks, and a purple. The purple is the only solid fabric...might change this if something printy comes along between now and workshop date. The other requirements are buttons and wool for applique eggs, but they won't be needed for awhile yet. After dinner and kitchen clean up, over the Netflix movie The Lone Ranger, pieces were cut for the first of 12 blocks for Konstituent. 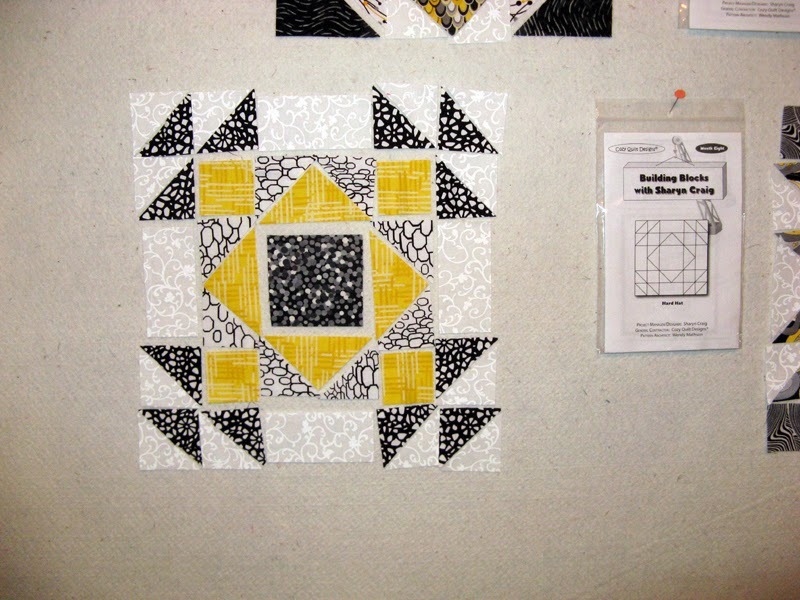 This block pattern is for Month Three called Picture Window. It took a bit of auditioning until these fabrics were arranged that I liked. As you can see from the photograph below the yellow is not prominent, but scattered about creating the "pop" that these black, white, and gray prints will need. 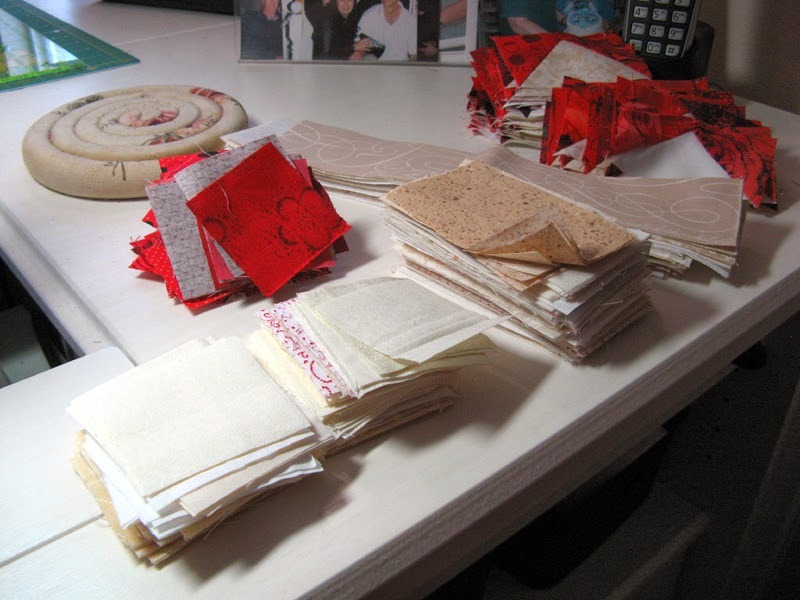 The yardage on the top left will be used for sashing, binding, and/or back.